Positioned on the southernmost point of Mexico's Baja Peninsula, Cabo San Lucas has attracted millions of visitors for more than five decades. The deep cool currents of the Pacific Ocean merge with the more temperate waters of the Sea of Cortez at the head of Land's End – located only a few minutes by water from Cabo Marina. Once a charming fishing town, Cabo San Lucas now appeals to travelers from across the Earth. A slew of first-rate resorts, scenic stretches of sand, splendid golf courses, world-class dining establishments, rollicking night-spots, and a sprawling marina complex make the region of Los Cabos the perfect vacation destination. Just a short jaunt from Cabo San Lucas Marina, and you'll have the opportunity to experience some of the finest Deep Sea Fishing on the globe. The teeming waters of the Pacific Ocean and the Sea of Cortez contain ample amounts of game-fish for Off Shore angling devotees. Depending when you visit Cabo, you'll have the chance to hook a number of incredible fighting fish, including: Wahoo, Sharks, Tuna, Jacks, Groupers, Dorado (also known as Dolphin or Mahi Mahi), and Marlin. Remarkable dive sites such as Pelican's Rock, Santa Maria Cove, Chileno Bay, and Cabo Pulmo offer Cabo vacationers some excellent places to scuba dive. Explore colorful underwater habitats bustling with aquatic life. You'll be amazed by the exotic variety of marine species found in the Sea of Cortez. Water-sports lovers have an assortment of activities to pick from besides the diving and fishing: surfing, snorkeling, parasailing, sailing, kayaking, and wave-runner-riding in the gorgeous waters off the coast of Baja California Sur. If you love desert landscapes, the back country of Baja is there for you to explore. If you are fascinated with the natural world, try an eco-friendly nature walk or horseback ride.If you are more of an adrenaline junky, head into the rugged terrain on an off-road vehicle. 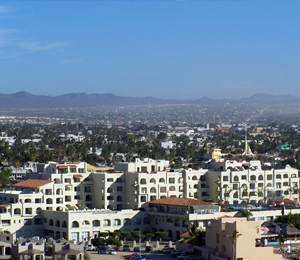 The region surrounding Cabo San Lucas is referred to as, "Los Cabos." Lo Cabos has three areas: the bustling downtown of Cabo San Lucas, the panoramic twenty-mile span of sea-side resorts of The Golden Corridor, and the quaint historic charm of San Jose del Cabo. Compared to the never-ending fiesta in Cabo San Lucas, San Jose del Cabo allows visitors to take it slow and unwind. Stroll the cobblestone avenues of San Jose and admire the colonial architecture, excellent eateries, and art and craft boutiques. But unlike San Jose del Cabo, Cabo San Lucas is world-renowned for its raucous nightlife. That's why university students from the United States and Canada descend on Cabo every spring to party at establishments like Squid Roe, Cabo Wabo, and Mambo Café.